When your cruise ship docks, see San Francisco at your own pace on a hop-on hop-off tour! From historical sites to modern San Francisco architecture, this tour uncovers the beauty and culture of the city. 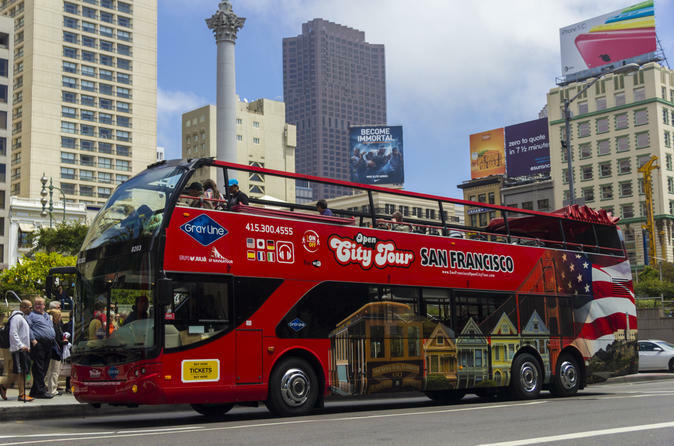 On modern, comfortable, environmentally friendly double-decker buses, travel around the city and see top attractions and neighborhoods like the Golden Gate Bridge, Fisherman’s Wharf, Haight Ashbury, Chinatown and North Beach. Complete with live narration, this tour is a fantastic and easy way to see all the sights San Francisco at your own pace. Upgrade the 2-day All Loops Pass to discover even more of San Francisco's must-see attractions. Begin your tour at Pier 41, a 15-min walk from the cruise terminal! This is the must-do sightseeing tour when visiting the City by the Bay! See the best of San Francisco at your own pace while you’re in port. On this do-it-yourself shore excursion, you can hop on and off the double-decker tour bus as many times as you like to see the city’s top attractions. In the summer, the top deck of the buses are open, and in the winter, clear tops shelter you from the cold and offer unobstructed views of the city. The duration of the tour loop will cover 24 stops. Hop off whenever you want to explore neighborhoods like Chinatown and North Beach, or to see popular attractions like Lombard Street. If you miss something on your first loop of the city, simply re-board the bus and go around again! See even more the Bay Area's most celebrated attractions when you upgrade to include the 2-Day All Loops. Enjoy two days of hop-on hop-off privileges in San Francisco, take a trolley across the Bay to visit charming Sausalito and pick a day to tour the city by night. This excursion is located within a 15-minute walk to the cruise port, so you determine the time you return to your ship in San Francisco. Please allow yourself ample time to enjoy the excursion and ensure your timely return to the port. This excursion is not covered by our worry-free policy.